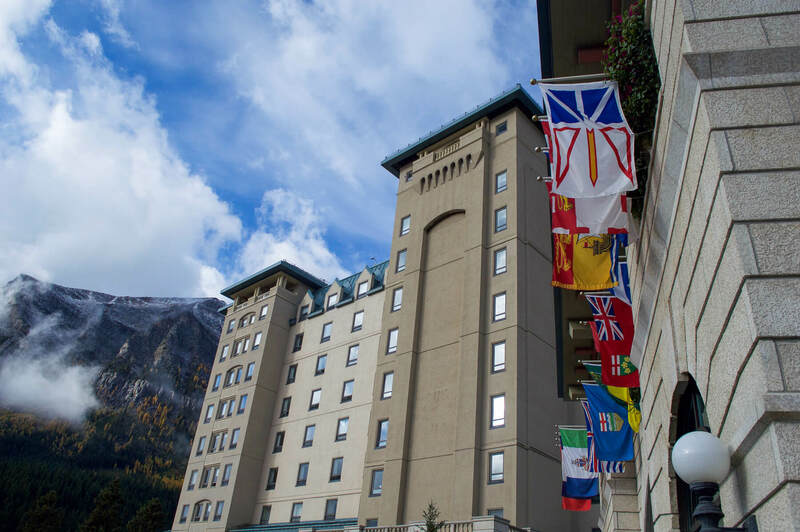 The Fairmont Château Lake Louise is a place I’m sure you all have heard of. 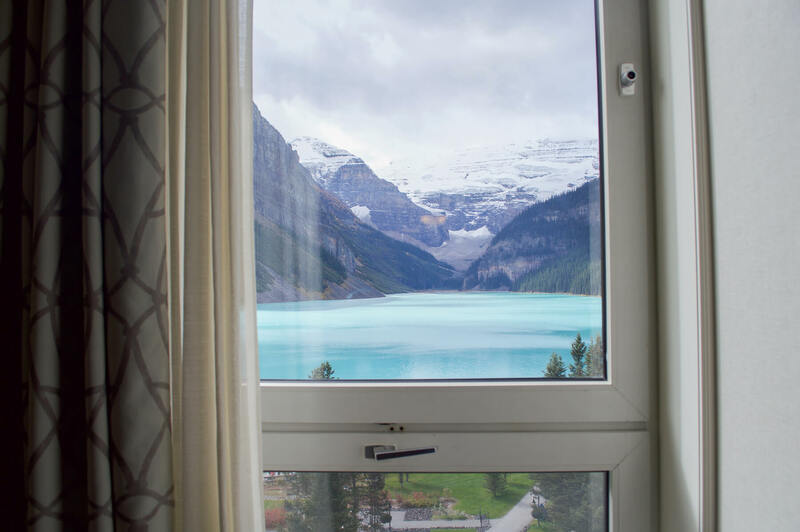 This fairytale hotel situated directly on the edge of the beautiful Lake Louise is a place I had only ever dreamed of visiting. With crystal blue waters, glacier views and snowy mountain peaks I had only hoped that this place would resemble the iconic photos I’d seen all over the online world… And it was. Once arriving at this breathtaking hotel, we were greeted by charming, welcoming staff that were eager to help us with all that was required. We were informed of the surrounding areas at check-in, popular things to do and the best places to eat in the hotel. Our room was not yet ready, but that was certainly no concern. An amazing lunch was had whilst overlooking the lake for the very first time, and boy was it impressive! The hotel is of an indescribable size. There are 5-6 different restaurants to choose from – all of which were of the highest of standards (and with the best vegetarian meal of my entire Canada trip might I add). There were many different shops on the grounds that had all that you needed for a visit, and more. The amazing service from all of the staff was evident from the moment we stepped foot out of our ride. Attention to detail throughout the building is something you won’t find elsewhere. This luxurious resort was originally built in 1911 which makes it stand at a respectable old age of 105 years. But it certainly doesn’t look it. Now, the view from the room is where the real magic happens. Nowhere else in the world will live up to the views of this glacially fed lake and mountain tops that are seen from the comfort of your own bed. I mean, does it get any better? If laying in bed and enjoying the scenery is getting a little boring (I guess your crazy) there is another option to save you. Films are available to rent from your TV – some that were yet to be available on DVD. Breakfast is delivered to your room with the daily newspaper – The room was safe, secure and absolutely beautiful. Unfortunately, during the day, the lake is swamped with tourists. From the moment you look outside your window in the morning, there are hundreds of people surrounding the lake from every corner. Certain areas of the hotel itself are also open to the public… But thankfully hotel guests will always have priority! Once stepping outside the Château, the views really do get 100x better. The walk around the right-hand side of the lake will take you to a few different trails that are available – all of which are of different lengths and difficulties. There is definitely something for everyone – and they are a great way to escape the crowds too. 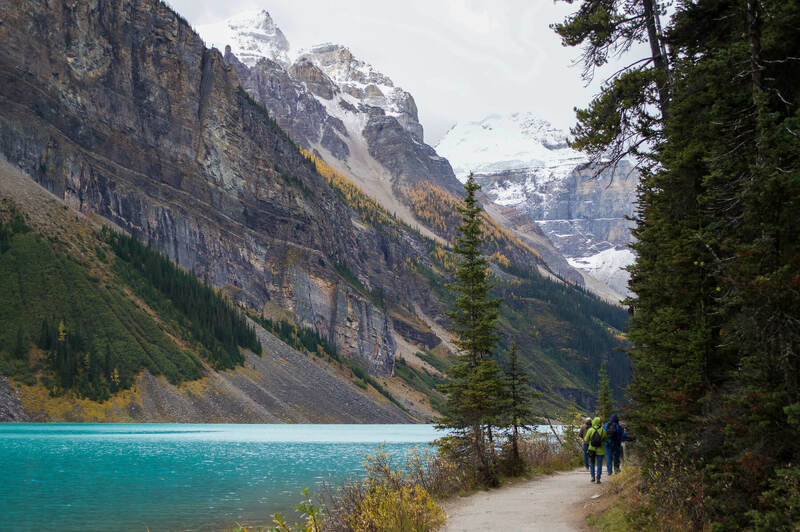 The longest walking trail takes you directly to the face of ‘The Plain of the Six Glaciers’. This walk is around 6km one way, to beautiful viewing points and a tea house overlooking the ice. 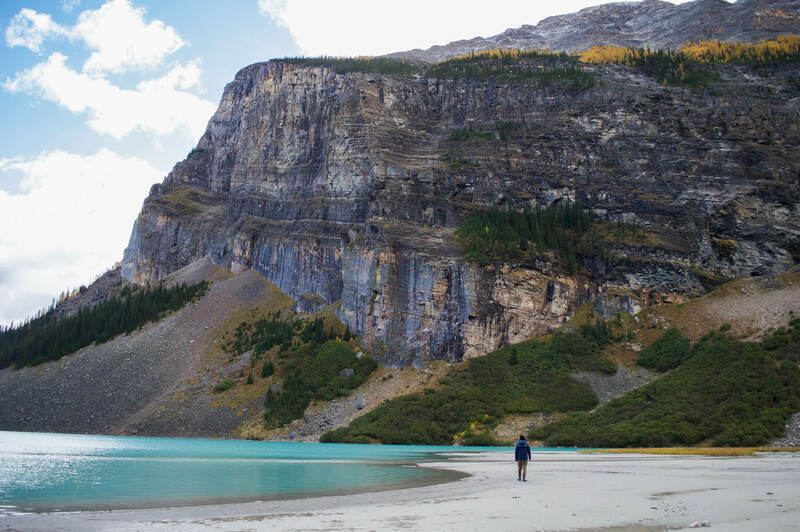 Nonetheless, the walk to the opposite end of Lake Louise will give you pretty amazing views. You’ll have the opportunity to view the Château from a completely different angle, whilst watching the foggy blue glacial melt stream its way into the lake. Whilst I was exploring this end, it began to snow which made the experience even more magical. The turquoise blue water for those of you that don’t know, is what happens when the glaciers grind up the earth beneath them. The rock that dissolves beneath these glaciers is what they call ‘rock flour’ and is what causes the foggy, turquoise colour to form once it reaches the water from the glacial melt. The small particles don’t float to the floor, they instead are suspended through the water. This minuscule amount of dust absorbs the long wave of colours from the colour spectrum, scattering the remaining back to our eyes.. blue and green. Pretty neat! Another activity that I would highly recommend is a canoeing adventure on the lake. For a time of either 30 minutes or an hour, you will be able to explore this lake in a completely different way. You will see fish swimming beneath you and you will have the chance to explore the shores that are not accessible by foot. Hotel guests will also receive a pretty hefty discount, bonus! 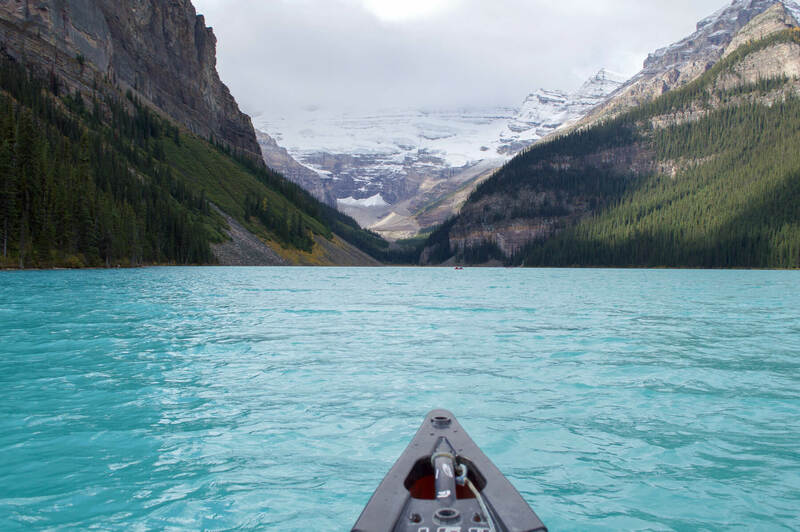 Unfortunately if you visit Lake Louise in the winter months, canoeing simply isn’t possible. As I’m sure you can imagine, this lake becomes entire frozen over… And turns into a winter wonderland. So definitely make the most of the water if you can! 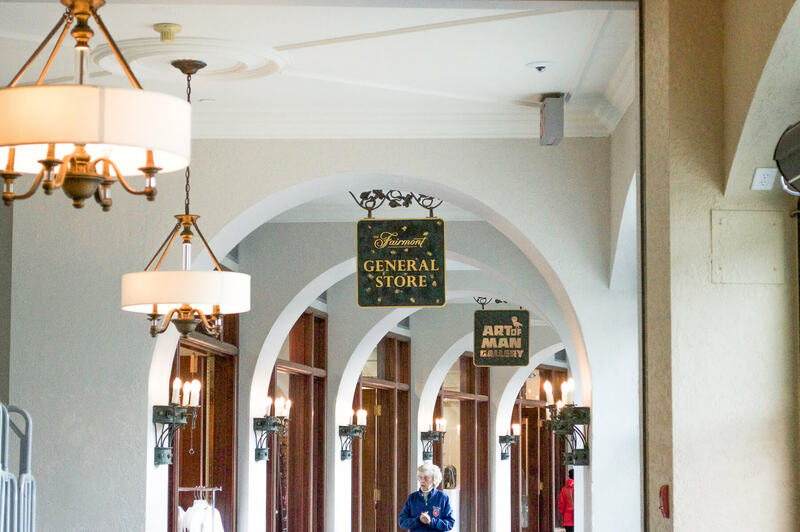 If you’re looking for another place to explore in the area, the concierge is always available to assist. They’re always very helpful and give useful information to help you on your way. Free shuttle buses are available to the town village, the gondola (the place where the most Grizzly bears are spotted in Alberta) and to the neighbouring lake, Lake Moraine. 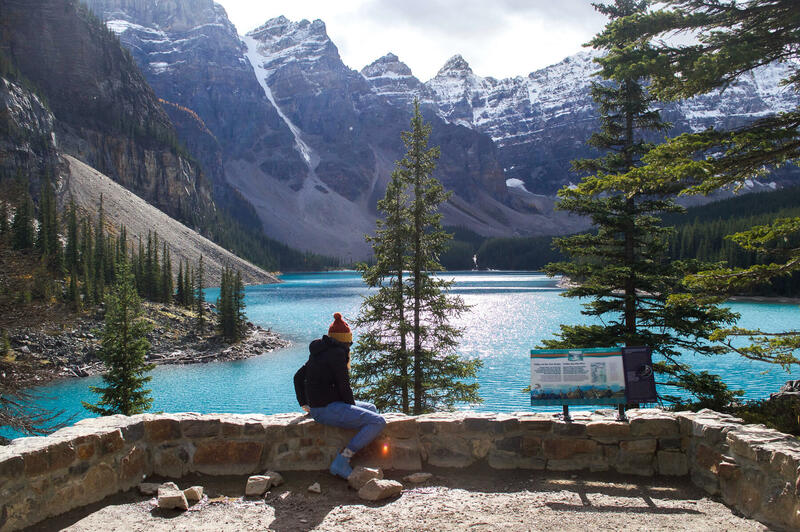 Travelling to Lake Moraine will cost you a little money, but the shuttle is very reliable and the ride is only 10 minutes. It will pick you up and drop you off directly outside the door of the Château. 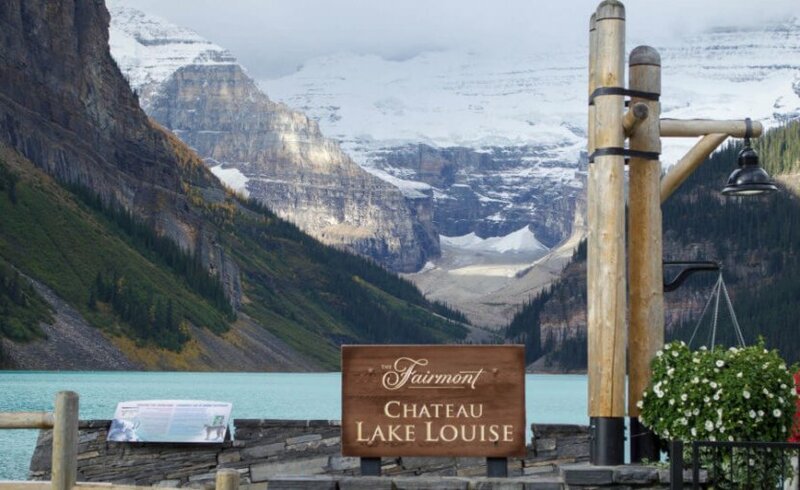 This lake, due to its glacially fed attributes like Lake Louise, also has a vivid turquoise colour. It is surrounded by jagged mountain peaks, glacier views and fun activities too. 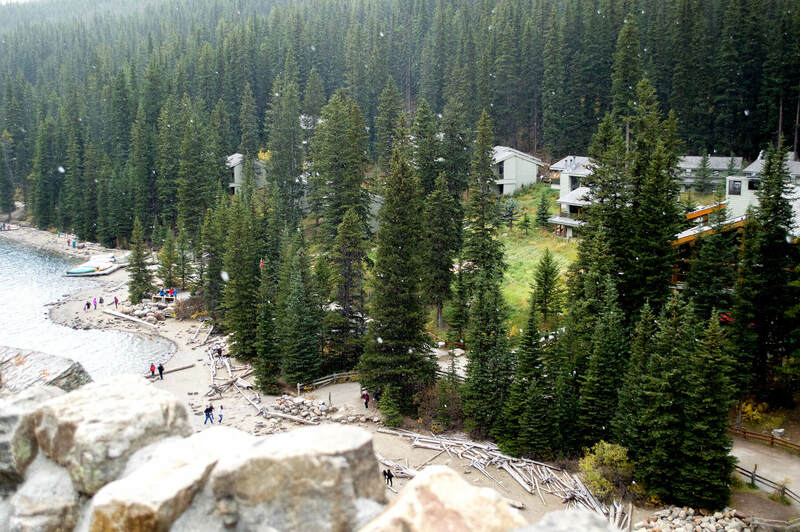 There are short walks up to viewing platforms that allow you to view the lake in ways that you’re unable to at Lake Louise. There is a cafe, tourist shop, lodge, canoeing activity and hikes much the same. During the winter the road is closed due to avalanche hazards, so depending on the time of year it’s definitely worth the visit. 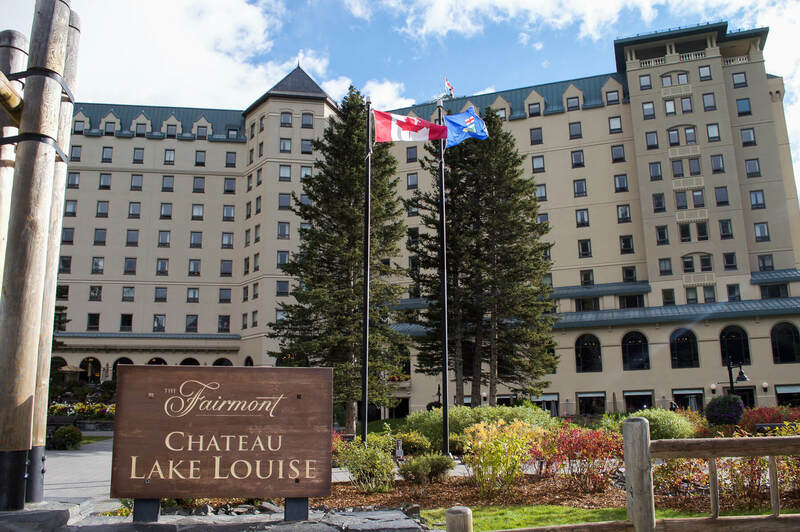 2 nights at the beautiful Fairmont Chateau was the perfect amount of time for a quick visit – Although, I definitely could have stayed here for the rest of my life if I could (it lives up to the expectations and 10x more). 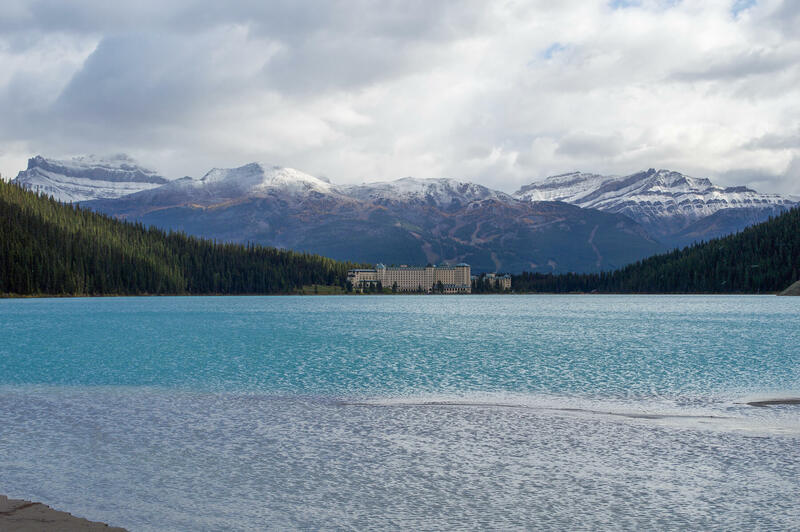 There is nothing more beautiful than waking up to snowy peaks, glacial views, a turquoise lake and an incredibly stunning hotel. If you’re wondering if it’s worth the very pricey hotel fee… Yes, It 100% is. 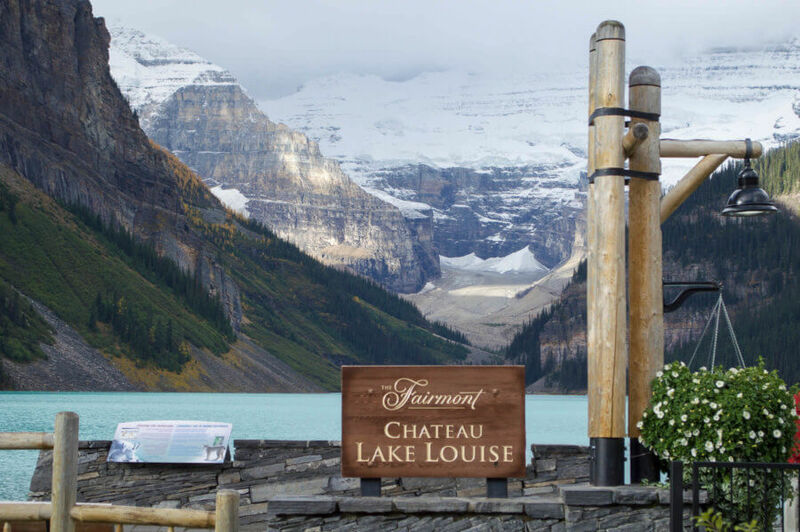 The Fairmont Château Lake Louise is a place that you’ll remember for the rest of your life. Nowhere in this world is perfect, but Lake Louise is pretty damn close.